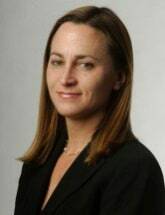 Attorney Kelly Enders is the managing partner at Caroselli, Beachler & Coleman, L.L.C. She graduated from the University of Pittsburgh in 1988 with a Bachelors of Science degree in political science. She continued her studies at the University of Pittsburgh in the Psychology in Education Master's Program and the Duquesne University School of Law where she earned her J.D. in 1998. She is admitted to practice in Pennsylvania and the U.S. District Court, Western District of Pennsylvania. Attorney Enders is a civil trial attorney and has trial experience in cases involving auto collisions' premises liability, tractor-trailer collisions, product liability, assault, battery, intentional infliction of emotional distress, false imprisonment and negligent hiring. In addition to the above, her case experience also includes bad faith insurance, breach of contract, civil rights, mental health malpractice, negligent entrustment of a firearm, medical malpractice, negligent security, mold, asbestos, Federal Torts Claim Act, Federal Employers' Liability Act, and actions involving the Commonwealth and local agencies. Her jurisdiction experience includes Pennsylvania state and federal courts, West Virginia Federal Court and Ohio state courts. She has experience handling various state subrogation issues arising under Pennsylvania, Ohio, West Virginia, Florida, Indiana and California state law, as well as federal subrogation issues. Attorneys Enders was selected to be included in the Pennsylvania Super Lawyers list of Rising Stars in both 2006 and 2007, and as one of the top 5 percent of attorneys in Pennsylvania in 2013, 2014, 2015 and 2016. She was listed by Best Lawyers in America for both Personal Injury Litigation and Product Liability Litigation in 2013, 2014, 2015 and 2016. She is a member of the Allegheny County Academy of Trial Lawyers, Allegheny County Bar Association (member, Judiciary Committee 2007-2010), Pennsylvania and American Bar Association, Western Pennsylvania Trial Lawyers Association, the Pennsylvania Association for Justice (member, Board of Governors 2007-2013) and the American Association for Justice. Attorney Enders is also very active in Pittsburgh and the surrounding communities through her involvement since 2001 with the nonprofit volunteer group, The Junior League of Pittsburgh (Board of Directors 2004-2006, Executive Board 2007-2008), and as a former member of the Advisory Council for the nonprofit organization, Strong Women Strong Girls.